Alex Wagner is a co-host of The Circus on Showtime and a contributing editor at The Atlantic. Above, she speaks at the 69th Writers Guild Awards on Feb. 19, 2017, in New York City. 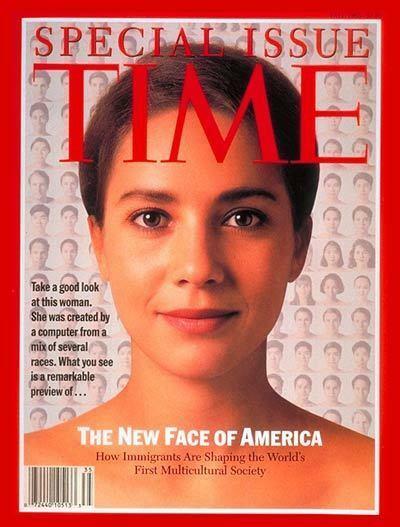 Time's "The New Face Of America" issue was released Nov. 18, 1993. Wagner remembers seeing the cover as a teenager and embracing her identity as a "futureface." "I liken it to sort of thinking you were a pigeon and then finding out you were a toucan," says Wagner, now a journalist. "It was like this thing that no one else had, this 'futureface.' But as I got older, I felt the weightlessness of that. And I wanted to know what grounded me." Wagner was filled with questions about where she belonged, which family stories were myths and which stories were left untold. Her new book, Futureface, is her attempt to find answers about her ancestry. "In the initial stages, I sort of started talking to family members, and they would tell me these stories," Wagner says. "And inevitably — we all find this — there were snags in those stories, little kind of asides that didn't make sense. And I pulled them, and that's really what the book is about." Burma — and let me be clear, it's also known as Myanmar — and the reason a lot of Burmese and Burmese exiles call it Burma: It's a form of political resistance to the ruling military junta. The stories of Burma were always redolent with the scent of frangipani blossoms, and, you know, these incredibly gauzy memories about life in the aftermath of British colonialism, which weren't ... political stories. But they were stories about this just incredibly romantic way of life. My grandmother would talk about having bananas at teatime and carrying palm fronds when the monsoon rains came, and I accepted all of those stories because they were like poetry. But they weren't grounded in any particular reality, and they didn't answer the fundamental question, which was, "If life in Burma was so good, why did we leave?" As I did the research talking to people in my family — namely my grandmother, who had the greatest wealth of stories — I also started cross-referencing some of the things she was telling me about with historical documents, which is not what we often do in the realm of family histories. And then, of course, I traveled to Burma. I went to the Burmese archives, which was a comedic endeavor if ever there was one. There was nothing, really — not much of an archives. But what I did discover is that some of these sort of petty bigotries that were made manifest in family stories tied back to a very violent and virulent strain of Burmese nationalism that I had never even considered. ... In many ways, the Burmese upper class like my grandmother turned a blind eye to Indian massacres that happened in Burma ... at the time my family lived there. On her father's side of the family and the "White Immigrant Origin Story"
For the most part, the White Immigrant Origin Story either glosses over huge parts of reality and history — or is just a lie. And in the case of my grandfather, what we knew about him was built on falsehoods. And as I went back to Luxembourg and did intense genealogical detective work to find out who this person was, I realized that he bore no resemblance to the person we thought he was. And that was important because the heroism that is a fundamental part of the White Immigrant Origin Story, I think, can be exclusionary. And what I'm trying to do in this book, I think, is to find a more inclusive narrative when we talk about America. And I think as simple as that is, it's changed my worldview. It's changed the way I think of every single day. I began this book really feeling lonely and really plumbing the depths of my existential despair, but I came out of it feeling like I was part of a fabric that was pretty tightly woven. Sam Gringlas and Melissa Gray produced and edited the audio story. Sydnee Monday adapted it for the Web. In 1993, journalist Alex Wagner, then a teenager, saw something familiar on the cover of Time magazine - a computer generated picture of a multiethnic woman who kind of looked like her. Wagner's father was white. He was from the Midwest. Her mother is from Burma. And after reading that Time magazine story on the new face of America, Wagner decided to embrace her identity as a so-called futureface. But as she got older, her ancestry filled her with questions about where she belonged, which family stories were myths and which stories were left untold. So Wagner embarked on a journey to find out. Her new book is called "Futureface," and she's with me to talk about it. Welcome. CHANG: So what really drove you to go on this deep dive? I mean, did you feel like you had neglected some sort of duty to understand your past? WAGNER: Oh, I feel like I'm always neglecting duty. WAGNER: But yeah, and I think I celebrated being a futureface. It was like being something exotic. I liken it to sort of thinking you were a pigeon and then finding out you are a toucan. WAGNER: It was, like, this thing that no one else had. But as I got older, I felt the weightlessness of that, and I wanted to know what grounded me. I wanted to find that sustaining thing, that community to which I belonged. I sort of started talking to family members, and they would tell me these stories. And inevitably we all find this. WAGNER: ...That didn't make sense. And I pulled them, and that's really what the book is about. CHANG: I want to talk about some of the snags on your mom's side of the story. You write about how your mother and your grandmother - they were very much Burmese, but you say that Burma was always kept at a safe distance from your family's American lives. What did you mean by that - safe distance? WAGNER: ...And carrying palm fronds when the monsoon rains came. And I accepted all of those stories because they were like poetry. But they weren't grounded in any particular reality, and they didn't answer the fundamental question, which was, if life in Burma was so good, why did we leave? CHANG: And you found that there was actually some ugliness, too, in those early years. WAGNER: As I did the research, talking to people in my family, namely my grandmother who had the greatest wealth of stories, I also started cross-referencing some of the things she was telling me about with historical documents, which is not what we often do in the realm of family histories. And then of course I travelled to Burma. I went to the Burmese archives, which was a comedic endeavor if ever there was one. There was nothing, really. CHANG: Not much of an archive. WAGNER: Not much of an archives. WAGNER: Yeah. But what I did discover is that some of these sort of petty bigotries that were made manifest in family stories tied back to a very violent and virulent strain of Burmese nationalism. CHANG: What was the most disappointing thing you unearthed? WAGNER: ...A racist term for Indians. And what I realized was when she was coming of age in Rangoon, Indians were the economic engine of Burmese society. Rangoon, where my grandmother lived, where my mother was born, was an Indian city, and yet the bigotries held between the Bamar Burmese and the Indian minority majority were profound. And in many ways, the Burmese upper class like my grandmother turned a blind eye to Indian massacres that happened in Burma, in Rangoon at the time that my family lived there. CHANG: Let's get to your dad's side of this story now. You use this phrase in the book. You call it the white immigrant origin story. I also love that you capitalize it. It's W-I-O-S for short (laughter). WAGNER: We're going to make shirts, mugs and tote bags. CHANG: So explain. What to you is the generic white immigrant origin story? WAGNER: The white immigrant origin story is effectively the American story, which is that we immigrants from Western Europe left the old world. We started anew. And because of our hard work and divine providence, we made it in America. CHANG: And part of you wanted very much to topple the myth of your great-grandfather, this patriarch of a Catholic clan. He had fathered 13 children. Did I get that right? CHANG: You loved the possibility that your great-grandfather was hiding a secret, that he might have been Jewish. CHANG: Why did you want so badly to shatter your white immigrant origin story? WAGNER: I think because for the most part, the white immigrant origin story either glosses over huge parts of reality in history or is just a lie. And in the case of my grandfather, what we knew about him was built on falsehoods. And as I went back to Luxembourg and did intense genealogical detective work to find out who this person was, I realized that he bore no resemblance to the person we thought he was. And that was important because the heroism that is a fundamental part of the white immigrant origin story I think can be exclusionary. And what I'm trying to do in this book I think is to find a more inclusive narrative when we talk about America. CHANG: Well, it turns out your family probably does not have Jewish roots. CHANG: What you ended up stumbling upon after this really long journey was, you know, more of a fractured understanding of where you came from. The more you discovered, the more questions you had. Your community just got more and more complex, and it was harder to figure out where you belong, maybe even harder than when you first began the journey. WAGNER: Yeah. I think we do a lot of work in this day and age focusing on the future and on the past. And we hope that somehow we'll find something in both places. But what I realized through all of this digging through - the place where you can really find yourself is of course right here and that we don't invest enough in the present. And when we think of community, we think of some sort of nebulous far-away group of people rather than the men and the women who touch our daily lives. And I realize that my people basically had been with me all along. CHANG: Identity is not something you unearth from generations ago. It's something you consciously can choose and cultivate in your own life. WAGNER: Indeed. And as simple as that is, it's changed my worldview. It's changed the way I think of every single day. I began this book really feeling lonely and really plumbing the depths of my existential despair. But I came out of it feeling like I was part of a fabric that was pretty tightly woven. CHANG: Alex Wagner is a co-host for "The Circus" on Showtime and a contributing editor at The Atlantic. She joined us to talk about her new book, "Futureface." Thank you so much for coming in today. WAGNER: Thank you so much for having me. Transcript provided by NPR, Copyright NPR.